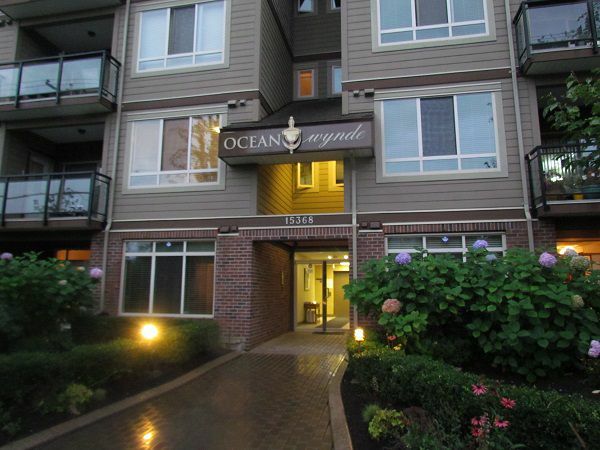 Gorgeous two bedroom, two bath ground floor condo in Whiterock. This 6 yr old bldg is in an excellent, highly desirable area. Home features an open plan with feature fireplace in living room, kitchen has granite countertops with breakfast bar, stainless steel appliances. Rich, laminate flooring in living/dining areas, and crown mouldings. Building has a rooftop deck to enjoy the views and fresh air. Walking distance to transit, shopping, library and restaurants. Excellent value! Sorry no pets permitted. Call Valley Realty at 604-755-4055 to schedule a viewing.